The last two days the Lord has shown us many times that He desires to give us eyes that see and ears that hear. I have read multiple scriptures about our eyes and our ears. I believe that the Lord is speaking to us about seeing Him and hearing Him clearly. This is somewhat eye opening to me. As I think about church services and religious motions that we sometimes go through as Christians, I think that there is a feeling of complacency, routine, and familiarity that can cause us to begin to honor God with our lips while our hearts grow farther away from Him. I want our worship to be pure and pleasing to God. I do not want to fall into routine, complacency, or to just go through the motions because it is how we think that we should operate. I want to continue to seek first God and His Kingdom in such a way that we are not conformed to the ways of this world, but we are transformed by the renewing of our mind. I desire to train up crusaders through God’s school that can understand Him clearly, hear His voice and obey without hesitation, and see Him at work in all that they do. I want the children that come through God’s school to know Him so intimately and in such a real way that the things of this world fade away and that He is what they know as the Truth. Today, Wednesday October 16th, we did things differently during our morning worship time together. We intentionally changed where we usually sit and the normal order of our morning devotion and worship time. 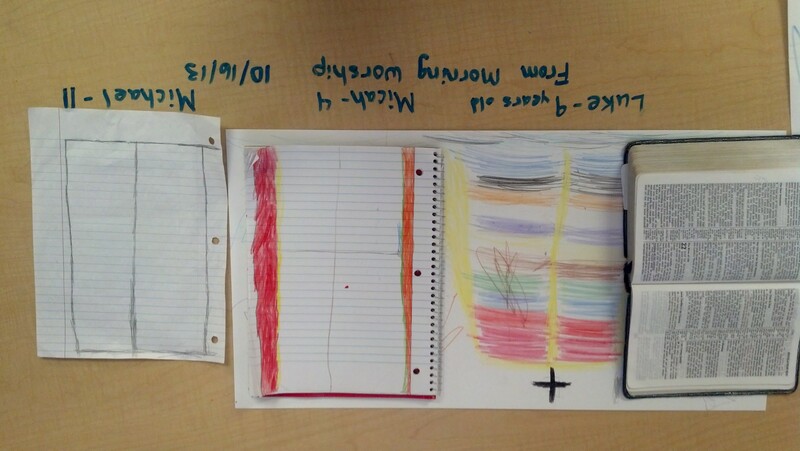 I had the children to all bring their writing journals with them this morning too. 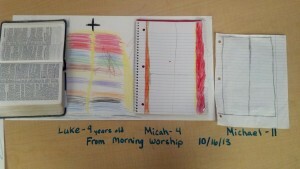 We normally have our journal time in our class, but I felt led to do things differently this morning because of how the Lord had been speaking to me. I talked briefly about how we had read the scripture about having eyes to see and ears to hear from the Lord. We all asked God to give us the ability to hear His voice and that He would allow us to see what He would want us to see clearly. I played my guitar quietly as every single adult and child began to write and draw as the Lord led them. It was absolutely amazing to hear the children share and show the pictures that they had drawn. Micah, my 4 year old little boy, another 11 year old boy, and a 9 year old boy all sat in different areas as they drew pictures this morning, and yet they all saw the same thing and drew VERY similar pictures. All of them talked about a gate, and they each drew the pictures that you see here. We later read Revelation 21:9-21 and we were in awe that the Lord had given us “eyes to see and ears to hear” today. The other interesting piece of this is that one of the drawings had twelve different layers of 12 different colors like in Revelation 21:19-20. I love that God uses His kids to display His BIGNESS! Please take time today to ask God to give you eyes that see and ears that hear, and to show you how to worship Him as He desires and to not just go through religious motions that may mean nothing to you. I am so glad that we took time to get out of “routine” today and am so thankful that the students and staff of ACA are learning to hear and see Him more clearly each day. ← Thank you God for FALL fun!